Sweet Alley presented by Mirvac was a huge success this weekend with lots of people visiting the event on Saturday 28 February and Sunday 1 March, as Melbourne Food and Wine Festival got off to a flying start. Visitors raved about the delectable desserts on offer at Sweet Alley, as they sampled delights from 24 of Melbourne’s finest producers and suppliers of tasty sweet treats including chocolatiers, ice cream vendors, coffee traders, cake makers, smoothie blenders and more! 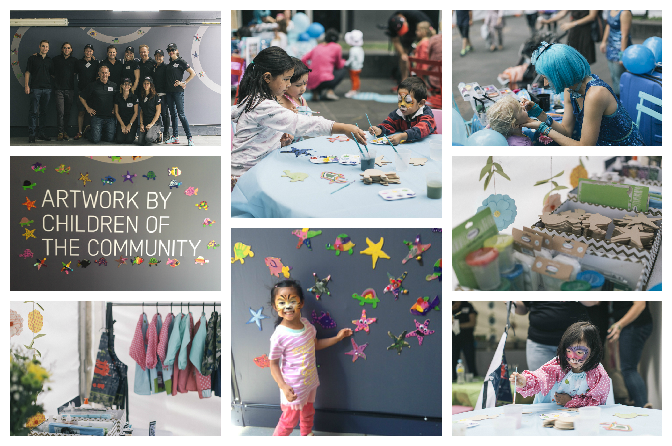 As proud sponsors, the Mirvac team made sure there was something on offer for all the family, with a whole raft of fun community activities happening all weekend. The Mirvac stand was awash with colour, as kids enjoyed having their faces painted as well as showing their arty sides by painting fish, turtles and starfish stencils. We loved the proud looks on their faces as their work was displayed along the construction hoardings at Riverside Quay. Over 800 brightly coloured stencils have now been used to decorate the hoardings for all the community to enjoy.